Timeline is one of the reporting functions of NET.Notes. Displays all changes that have occurred in the monitored databases during the last x (eg. 30) days. It monitors changes of documents as well as the creation of new records in databases. When you return from vacation after a week or two, simply open the “TimeLine” and see all the changes that have occurred in the projects, activities, address book, or in any other module you are using. 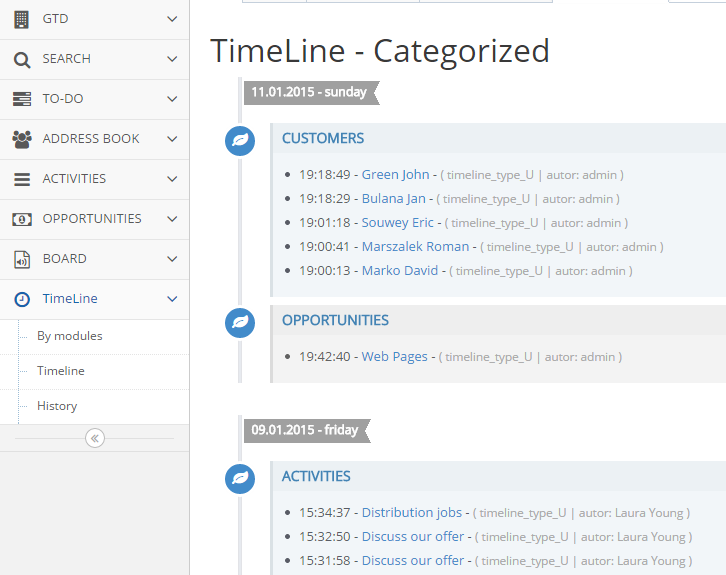 Timeline is a very useful feature of NET.Notes, so it is easy accessible from the workspace. If you need to get the latest information, click on the “refresh” in the upper left corner of the desktop and it will refresh not only the timeline, but each bookmark that is enabled. Or, you can refresh the entire browser page. Given that the active tab remains open, it restores the entire page, including bookmarks.